If you have any outstanding issues running Toon Boom Harmony after installation, review the installation and configuration instructions to make sure you have followed them completely. If you continue to have problems, consult the following list to troubleshoot common installation and configuration problems. If you are getting license errors when you start any Toon Boom Harmony module, check the set up and configuration of the license service. • Open the license.dat file. • Make sure that the license service is running. • If you continue having problems with the license server, locate the file ToonBoomLicense.log and send it to support@toonboom.com. In Windows, this file is usually in C:\flexlm;. Check the tbdbserver.log file. It is usually stored in C:\ProgramData\Toon Boom Animation\Toon Boom Harmony. If there is no log file, re-start the tbdbserver. 2. Double-click the Toon Boom Harmony Control Panel icon. The Toon Boom Harmony Control Panel dialog box opens. 3. From the Process Starter drop-down menu, select the tbdbserver entry. If you continue to have problems with the database server, locate the tbdbserver.log file and send it to support@toonboom.com. This file is usually in C:\ProgramData\Toon Boom Animation\Toon Boom Harmony. You can also run the Dbserver from the command shell in debug mode to receive additional information about the process. 3. Stop the tbdbserver service. Click the Start menu and select All Programs > Toon Boom Harmony 10.0 > Configuration Tools > Control Panel. When the Toon Boom Harmony Control Panel window opens, select the tbdbserver from the Process Starter drop-list and then click Stop. 4. Open a command prompt by selecting Start > All Programs > Accessories > Command Prompt. While you are running the tbdbserver in debug mode, messages will be written to the shell for each operation the tbdbserver performs. This is additional information to what is written to the tbdbserver.log file. 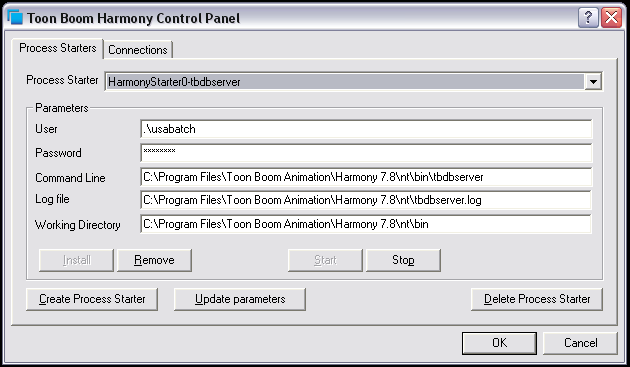 tbdbserver -debug > "C:\ProgramData\Toon Boom Animation\Toon Boom Harmony\tbdbserver_debug.log"
If you still cannot determine the nature of the problem, send this file to support@toonboom.com with a detailed description of the problem. If clients cannot open the sample scene, it is possible that they are not connected to the database server. Follow the instructions in to connect to the server. When you open the sample scene, you might get an error message that says that the resolution.conf file can't be opened. This file is usually stored in the environment or job directory of your database. \Program Files\Toon Boom Animation (x86)\Toon Boom Harmony 10.0\resources\samples directory.